Secondary glazing improves insulation, security and greatly reduces noise without the inconvenience of replacing your existing windows. Secondary glazing is fitted internally, thus minimising any disturbance to the property. Our secondary glazing range comprises of an aluminium inner frame joined to a timber outer surround which allows for a neat unobtrusive installation even in the most difficult situations. A range of sub frames and scribing trims can be used to assist face fixing, reveal fixing and the coupling of units. This allows for the satisfactory refurbishment of even the largest windows. 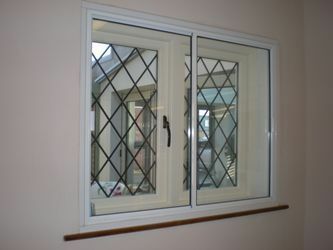 Secondary windows are particularly suitable for noise reduction and are often installed in houses on busy roads or near railways or airports. If you want to find out more about our secondary glazing and how it can benefit you, contact us now. Suitable for all types of properties including grade one and two listed buildings and those buildings where there is a need to improve insulation, eliminate draughts and reduce external sound without changing the external appearance or character of the property. Secondary double glazing is increasingly being used by landlords as a way of reducing heating bills and achieving building regulations in Flats and Apartments.